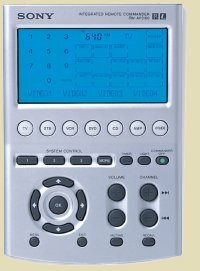 Home theater, also called home cinema, seeks to reproduce cinema quality video and audio in the home. 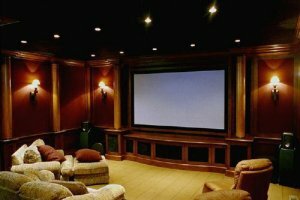 Technically, a home cinema could be as basic as a simple arrangement of a television, DVD, and a set of speakers, or as complex as a front projector, full surround sound, and integrated lighting. 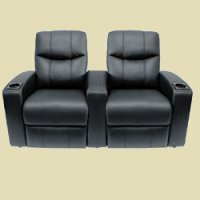 Today, "home cinema" implies a real "cinema experience" and therefore a higher quality set of components than the average television provides. 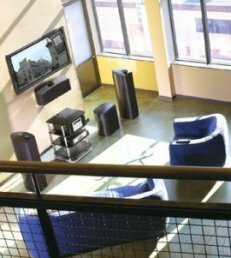 You can have any custom entertainment system installed using the latest state of the art components. We can even supply seating, lights, carpet, and anything else necessary to make your theater complete. Enjoy the experience of the multiplex in the comfort of your own home.